In 1880, the squalid streets of Victorian London are terrorised by a grisly serial killer called The Limehouse Golem. The Golem appears to have no story - its victims innocent and seemingly unconnected. Under immense public pressure, the police hand the case to Detective Inspector John Kildare (Bill Nighy) - a talented investigator whose career has been stifled following rumours that he “is not the marrying kind”. Kildare soon realises that he is being set up as a scapegoat. Reassessing the case, Kildare finds a clue that narrows his search to four key suspects: the novelist George Gissing (Morgan Watkins), philosopher Karl Marx (Henry Goodman), music hall star Dan Leno (Douglas Booth) and journalist turned playwright, John Cree (Sam Reid). However, Cree has recently died - allegedly at the hands of his wife, former music hall singer, Elizabeth Cree (Olivia Cooke). Kildaire visits Elizabeth in prison, desperate for answers - driven by a desire to unmask the golem and save an innocent woman from the gallows. It’s not the destination, it’s the journey that entertains in Juan Carlos Medina’s gory, gothic tale (adapted from the novel by Peter Ackroyd). Yes, you may well guess ‘whodunnit’ surprisingly early on in the film. However, there is far more to enjoy in The Limehouse Golem than a simple answer to a single question. For Medina’s film is more interested in the inner lives of all of its players. Slowly, via flashbacks, they reveal themselves and we understand that, Golem or no, everyone is hiding disturbing, even monstrous, secrets. Nothing is what it seems. The London portrayed in The Limehouse Golem is a familiar place to anyone who has ever watched a Jack The Ripper story. The streets are dark and dangerous and death lurks around every corner. Meanwhile, the police fight a losing battle in a city where brutal murders (and their bloody crime scenes) are relished as cheap entertainment. Kildaire is disgusted by the public’s insatiable desire for the Golem - believing that this disturbing appetite makes everyone culpable for the horrors. He also has no time for bawdy music halls. However, as he listens to Lizzie’s story, he finds himself increasingly drawn into her world. It is here, in the theatre, that the film truly comes alive. Medina plays with fantasy and reality, fact and fiction - secrets and lies. Here - in stark contrast to the streets outside - all is bathed in golden light and splashes of rich colour. This is, of course, just an illusion, a sleight of hand to disguise the evil lurking beneath the surface. While this film may not shock with its big, final reveal, there is something comforting in the familiarity of Medina's film. Thanks to this, Jane Goldman’s sublime script and Bill Nighy’s superbly understated performance, The Limehouse Golem a very enjoyable watch. Alan Rickman was initially cast to play the role of John Kildare. That would undoubtedly have been an amazing performance. However, if another needed to step into the shoes of this detective, I'm glad it was Bill Nighy. The Limehouse Golem is, at times, surprisingly gory - you have been warned. 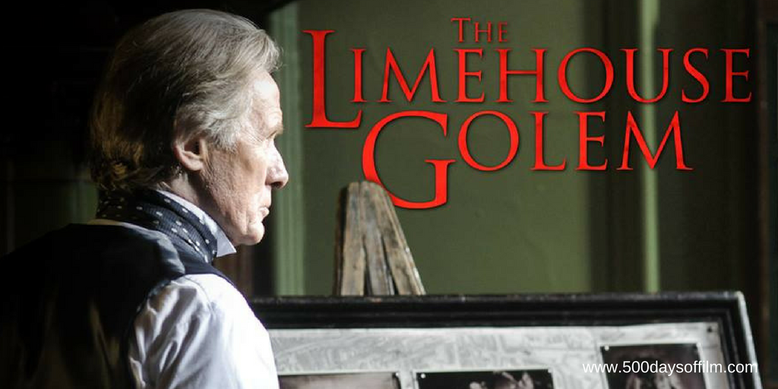 Have you seen The Limehouse Golem? If you have, what did you think of this film? Did you (no spoilers please) guess the culprit? If you did, did that ruin the film for you? Let me know in the comments section below or via Twitter or Facebook (@500DaysOfFilm)!